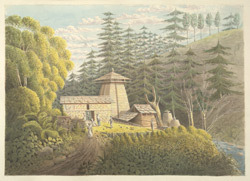 Water-colour painting of a Hindu temple at Jagasir (Bageshwar) by James Manson (1791-1862), c.1826. This image is from an album of 12 drawings of landscapes in Almora and accompanies a 'Report of the Mineral Survey of the Himalaya Mountains lying between the Rivers Sutlej and Kalee' by Captain J.D. Herbert, dated 1826 (Mss Eur E96, Kaye no.377). Manson was assistant to the Superintendent of the Geological Survey of the Himalayas from 1823 to 1828. Bageshwar is situated in the Almora district of Uttar Pradesh in northern India. Situated at the confluence of the rivers Saryu and Gomti the place of religious significance to Hindus as it holds the ancient and famous Bagnath temple from which the town gets its name. The shrine is dedicated to the Tiger Lord, an aspect of Lord Siva, and was erected by the Kumaun king, Laxmi Chand, about 1450, although it contains a Sanskrit inscription dating from an earlier period.